The Rev. Dr. Harry Middleton Hyatt was a folklorist interested in Adams County, Illinois and witchcraft. He began researching the Millers of Millersburg, Kentucky in 1973, to publish an update to the 1929 edition, but died (Dec. 1978) before he could publish his work. Harry Middleton Hyatt, M.A., D.D., was educated at Kenyon College and Oxford University, and served as assistant rector at the Church of the Holy Spirit in New York City from 1951 to 1965. After his retirement in 1965, Dr. Hyatt returned to his hometown of Quincy, Illinois. Hyatt’s best-known work came in his research in folklore. In 1935, he published Folklore from Adams Co., Illinois. He also wrote Hoodoo-Conjuration, Witchcraft-Rootwork, circa 1960. In addition to his writings on folklore, Hyatt did extensive work on his family history. He published The Millers OF Millersburg, Kentucky in 1929 and Descendants of John Walton of Baltimore Co., Maryland and Harrison Co., Kentucky in 1950. 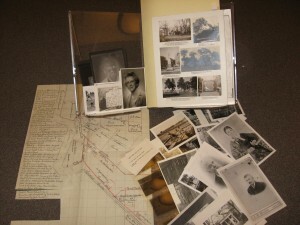 The bulk of this collection pertains to Hyatt’s research on the Baker family. Included is a chart outlining 455 descendants of Martin Baker (1600-1666). This chart serves as a valuable guide to Hyatt’s numerical organization and outline. Materials include handwritten note on various members of the Baker family and their descendants, as well as illustrations and photographs, and Hyatt’s revisions of The Millers OF Millersburg, Kentucky. There is also an index to seven of Hyatt’s notebooks, compiled by R.N. Smith. Researchers interested in accessing this collection can see the catalog record online, view the finding aid online or visit the Martin F. Schmidt library at the Kentucky Historical Society.